But all the doubts were shunted out the back door when arriving near midnight on an already late and delayed flight from Bangkok wondering if the airport shuttle we requested weeks ago would be forgotten, only to be met with the broadest smile, on a friendly face with the words “Ayubowan, welcome to Sri Lanka. No worries you are late, we waited.” It felt like home. But warmer. 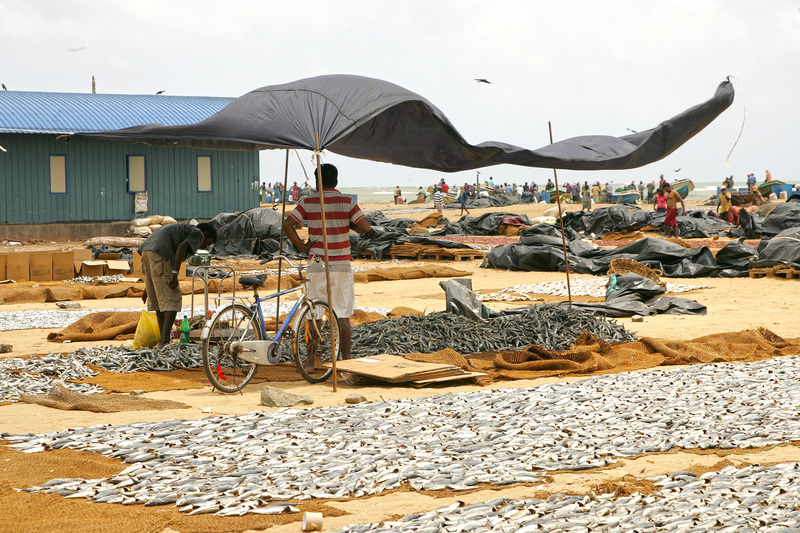 A quick stopover for 2 days to figure out which direction to take, saw us exploring Negombo Fishing Market and Lagoon for the first time. 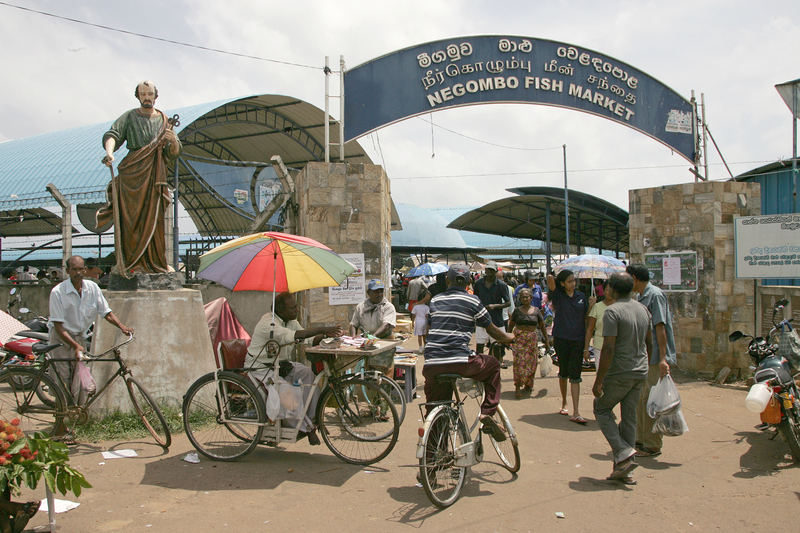 Negombo is situated 37 km north of Colombo city, about 7 km from the Bandaranaike International Airport, the fourth largest city in Sri Lanka, located at the mouth of the Negombo Lagoon. The city has a relaxed feel about it, with great beaches, restaurants and a bustling Fishing Market, the “Lellama”, (which is the country’s second largest) and a Fishing Port that was used during the periods of Portuguese and Dutch colonization. A time when it was also famous for the wild cinnamon that grew in the region, attracting a succession of foreign traders and colonial powers. Now it’s economy is vastly reliant on tourism and fishing, with the daily fishing auctions having become a popular tourist stop. 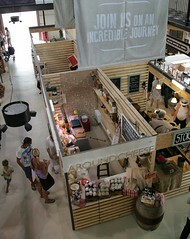 The market, like any other live produce or fish market, is not for the squeemish, or those who prefer to imagine their evening dinner has gone straight from the ocean to Gordon Ramsay’s super sanitized, stainless steel work surface and onto their plates. Probably not good after a “babalaas”, rum tasting cocktail session of note either! 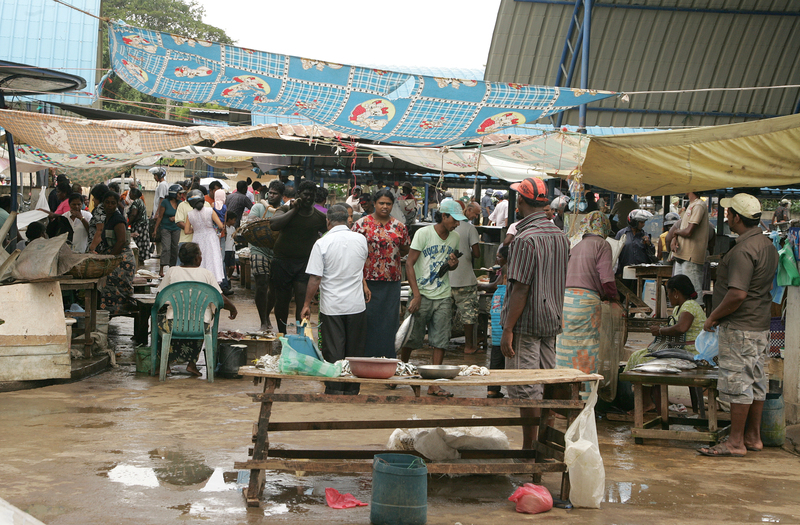 An early morning, energetic and bustling, working fishing market. 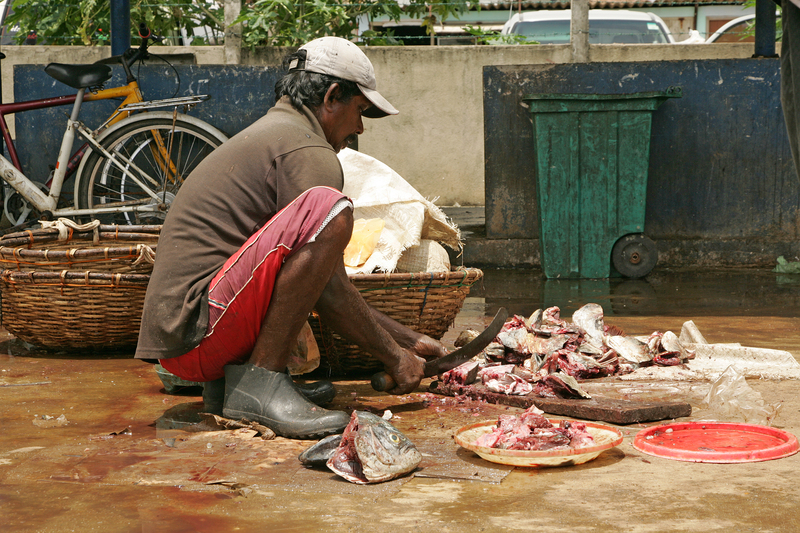 Blood, guts, crows, dogs, flies and piles of fish from the lagoon and ocean of any description – prawns, crabs, shark, tuna, whole or chopped and so fresh it’s still twitching. Well, some of them are. 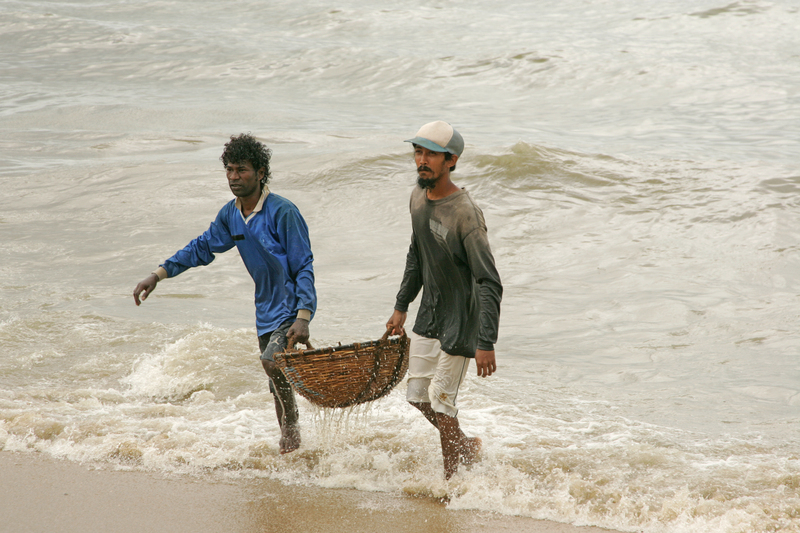 While men in sarongs, pulled high up above their knees, feet covered with sand, blood and mud, load and weigh baskets of fish, others throw out more and more piles from the boats onto the beach. It’s a hive of activity with wholesalers jostling for the best price, individuals looking for a special something for the family feast and tourists trying to get a pic without getting in the way or getting fish guts on their shoes or cameras. A daily event, except for Sundays as strangely, Negombo is predominantly Christian thanks to the colonizing Portuguese and Dutch invaders many moons ago. In a country where nothing goes to waste, whatever is left over, big or small, will be dried. Thousands of fish can be seen drying on hessian matting on the sandy shores, while dogs lurk in the background hoping for a discarded snack and crows greedily have their pick of the bunch at free will. It’s enough to make the Health and Safety control freaks of the Western World get instantaneous salmonella poisoning. An age old tradition, and essentially a sub-industry of fishing, dried fish is a much used item in any kitchen and household. 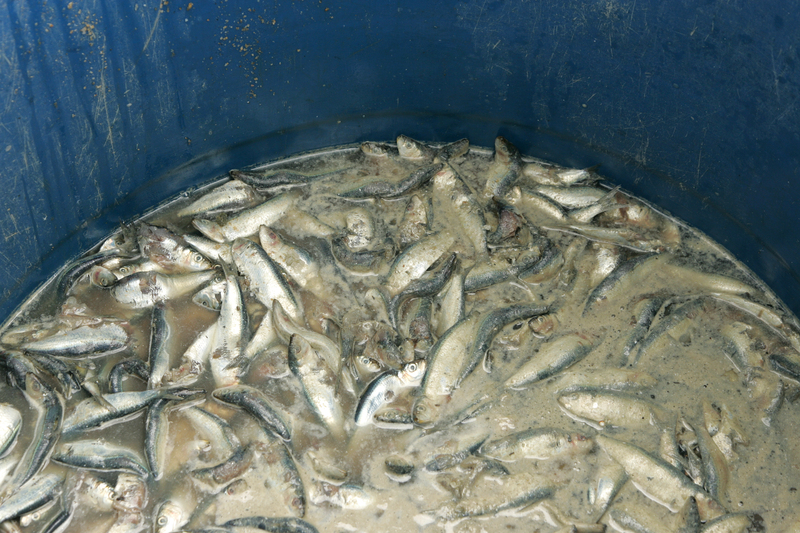 The fish is washed and depending on the size of the fish either kept whole or split prior to salting. The internal organs are taken out and heads and tails chopped off the bigger fish and then cut into chunks. Smaller fish remain intact. 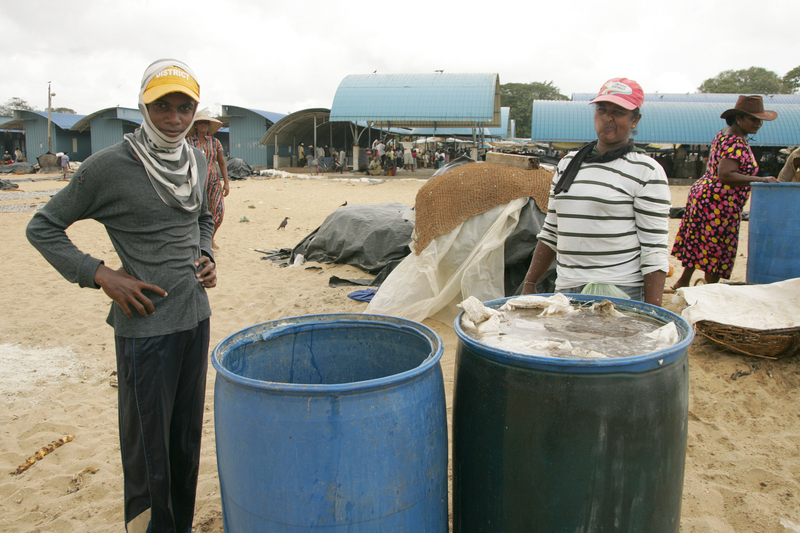 The fish is then salted in big plastic drums filled with brine for anything up to 3 hours. The fish is then removed and rinsed in the shallow waters of the nearby ocean. This process also makes removing the scales off the smaller fish easier. The fish is then salted and laid out to dry. 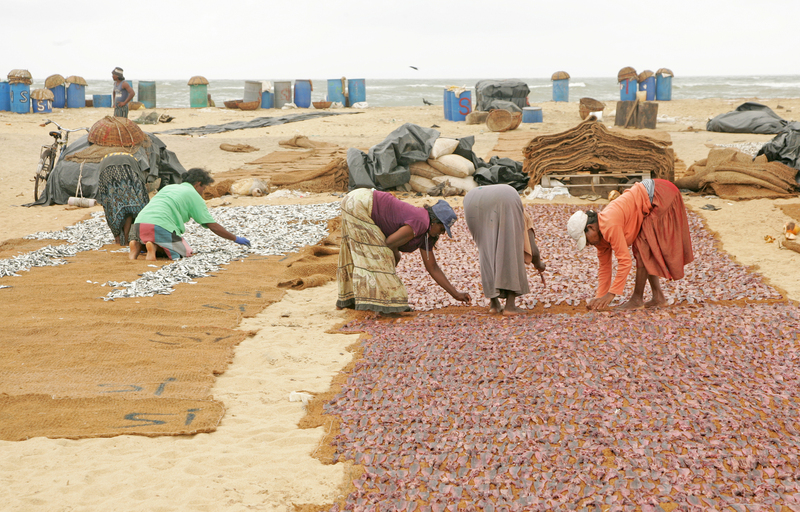 Once again depending on the size of the fish and the weather, the process can take anything from 1-3 days to complete before it’s sold to wholesaler sand small scale traders. Rainy weather and grey skies can play havoc with the results. Any sign of wet weather and the half dried fish can be packed away for the next sunny, dry day. 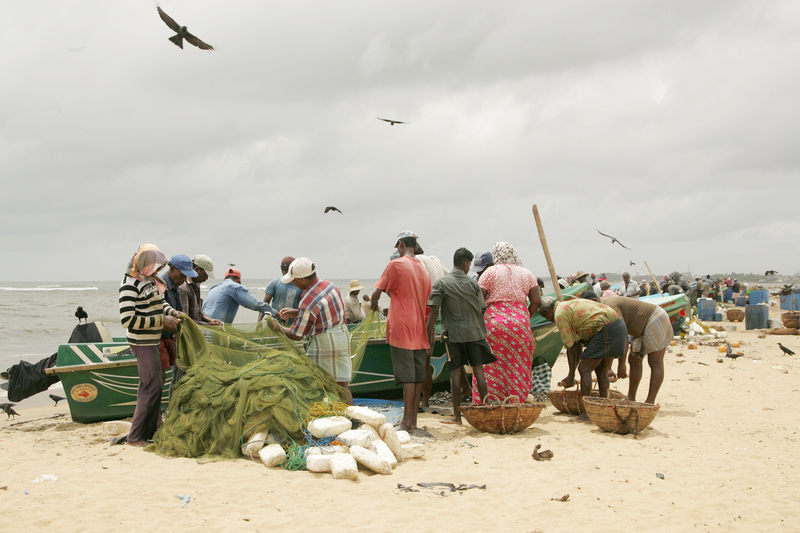 The Negombo Lagoon once considered one of the best wetlands in Asia is also a huge attraction, but sadly pollution and illegal land filling are killing it. The lagoon with its extensive mangrove swamps and attracts a wide variety of water birds including cormorants, herons, egrets, gulls, terns and other shorebirds, is home to over 190 species of wildlife and is fed by a number of small rivers and a canal and is linked to the sea by a narrow channel. 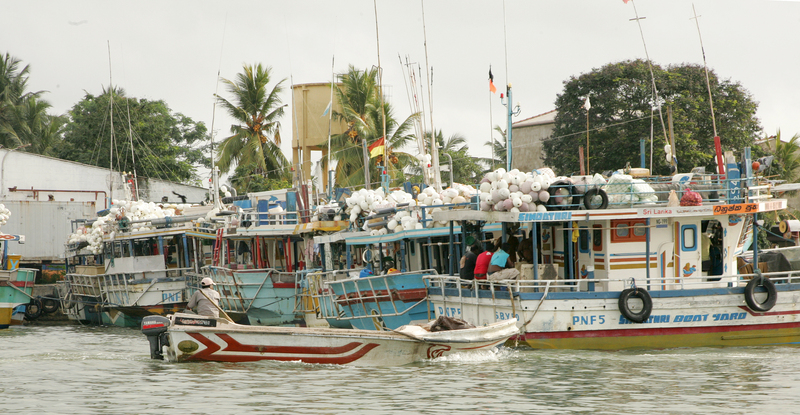 Many of the fishing families live in communities spread out along the Negombo Lagoon. 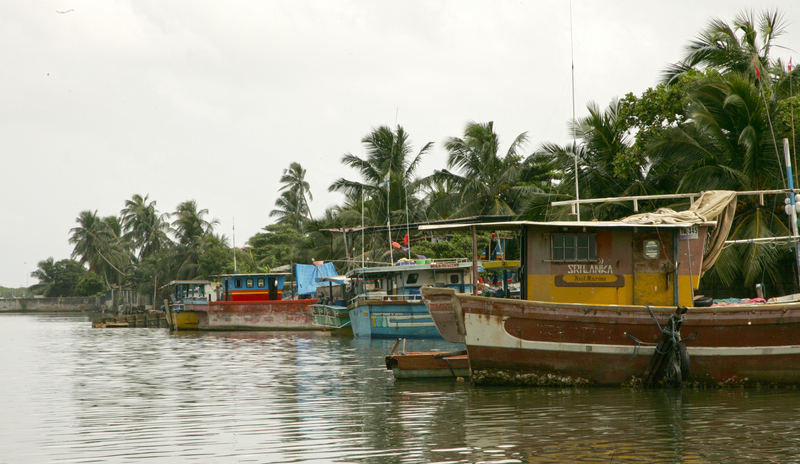 The fishermen are poor, hard working folk and live in shanty thatch palm villages along the water’s edge. They rely mainly on their traditional knowledge of the seasons for their livelihood, using outrigger canoes carved out of tree trunks and nylon nets to bring in modest catches from September through till April. Their boats are made in two distinct forms, oruvas, like a sailing canoe and paruvas, large man powered catamaran fitted with kurlon dividers) and are said to have originated in the islands off the Mozambican coast; they were brought to Sri Lanka by Portuguese traders in the 17th century. For generations the lagoon has provided them with a plentiful supply of crabs, shrimps, lobsters, cuttle fish and many of the native species of fish. 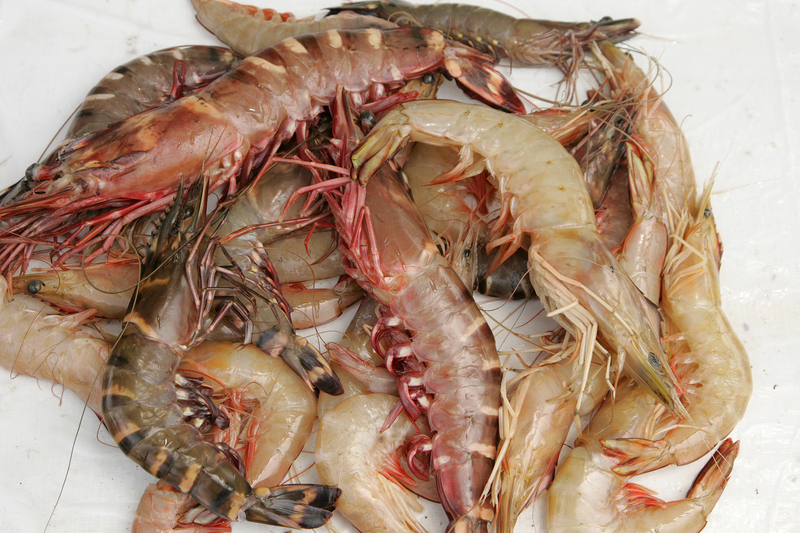 Ever since prawn fishing in the lagoon began, the economic value of the lagoon increased massively. Yet the industry has dwindled because mangrove clusters situated around the lagoon have been destroyed to fill land. 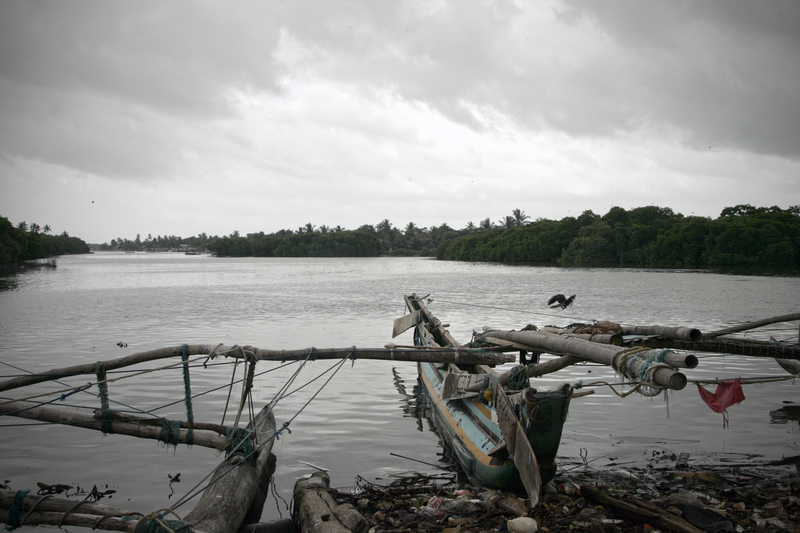 While mangroves covered an area of 700 hectares in the early 1980s, some 400 hectares have been destroyed of late. 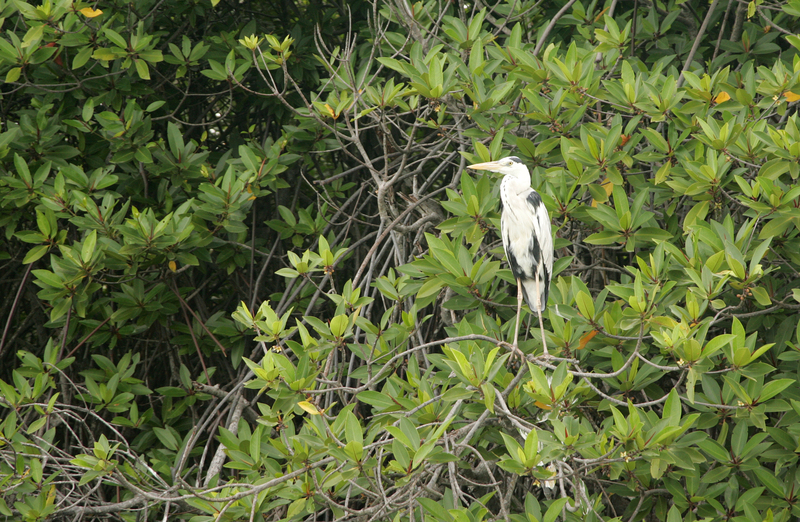 Mangroves are essential to lagoon life as they provide safe breeding places for lagoon fish. When they are destroyed, the lagoon starts dying. Unfortunately like all modern development, it’s the money that matters and the lagoon itself is under threat with resorts and hotels being built on the banks of the lagoon with little thought given to the impact on the natural environment. Along with society’s elite, backed by influential people, building holiday homes and bungalows along the lagoon banks. Another problem is caused by the deep-sea-going boats anchored in the heart of the lagoon. These discharge burnt oil killing the small fish, when oil remains in the lagoon-bed, crab and prawns are also affected. Without a harbour for safe anchorage, they moor inside the lagoon aggravating the pollution. The more we travel the more I realize that nothing stays the same and unfortunately many of the families over time will have to resort to other means of earning a living to survive as the natural habitat and their environment is slowly destroyed. I’m pleased I got to see the thriving market as, even though it must have been even more active 20 or 50 years ago, I think in another 20 years, there may only be supermarkets and frozen fish to supply the needs of the 5 star resorts and homes along a lifeless lagoon. 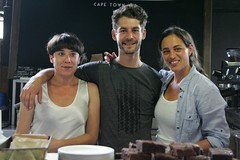 Great article Tania. While reading your lines, I can picture myself over there in India long time ago…We went to South of Calcutta in a fishing village called PURI, which means rotten in France!! !, We stayed hours on the beach not for sunbathing but for watching boats going out and coming back loaded with amazing creatures such as fish, but also manta rays, dolphins, turtles, sharks and so on. Women in their colorful saris on the dull sand waiting for their possible husbands to grab “the” catch of the day out of the boat in their turtle baskets! . Fish drying on the roofs of little miserable huts. Money blablabla. Poor people fighting against vultures to get their small piece of fish. But what an experience as a tourist! I love your description of traveling. Our world is going too fast. We don’t have the time, we don’t take the time, what is thriving us in life? Why are we running, after what, what for? This is probably why we’ve chosen a sailing boat to discover the world in the slowest motion:-) But when we used to backpack, it was already with that kind of pace. We’ve always stayed in villages enjoying meeting people, joking, eating, sightseeing with them things that would never be written in a guide book. Such a good way to travel. ENJOY…the true, the real, the wild world. Will be in touch soon for a sundowner!